One of the most daunting novels in European literature, the concept of James Joyce’s Ulysses is deceptively simple: it is the story of a single day, June 16, 1904. The central characters, a middle-aged man named Leopold Bloom and a young writer named Stephen Dedalus, embark on a contemporary Odyssey around the city of Dublin, Ireland. Parallels between their journeys and Homer’s Odyssey abound. Each of Ulysses’ 18 chapters is written in a different style and is incredibly dense with puns, allusions, and plays of language. Joyce frequently makes use of a stream-of-consciousness style of writing. 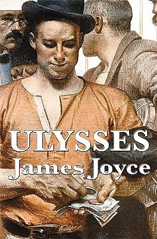 The novel is a sequel of sorts to Joyce’s previous book, A Portrait of the Artist as a Young Man, which featured the same Stephen Dedalus as its main protagonist.